Find contact information for Wood-Mizer's offices and representatives in Asia or fill in the form to send us a message, request price quotes, get a catalogue and more! The EG400 is a rugged board edger that is at home in commercial sawing businesses that require a fast, accurate, and heavy-duty board edger. The EG400 edges material 700mm wide by 100mm high at 30 metres per minute, and smaller material at up to 54 metres per minute. The remote operator’s control console manages all edger functions, and can be repositioned as needed. The 22kW motor delivers plenty of power for softwoods and hardwoods. The edger automatically adjusts feed speed depending on the thickness of the board being cut. Two 400mm blades are mounted on a splined shaft and move in and out from the centre, allowing the use of an optional outfeed board conveyor. Two lasers are standard on the EG400 for board positioning, and it is equipped with anti-kickback protection and other safety features including a perimeter e-stop cable and electrically interlocked safety covers. The standard infeed table is available with optional rip fences. An optional tailer outfeed keeps the edged boards moving through the line, while enabling easy waste removal. Optional electronic setworks are available. Power for softwoods and hardwoods. Reposition controls in the best location for operator productivity. Move in and out from the centre. The twin lasers enable the operator to see how to get the most out of the board. Sylvan Plyboard India Pvt Ltd. has added additional Wood-Mizer sawmills to continue optimising their timber production, which produces around 700m3 of timber daily. 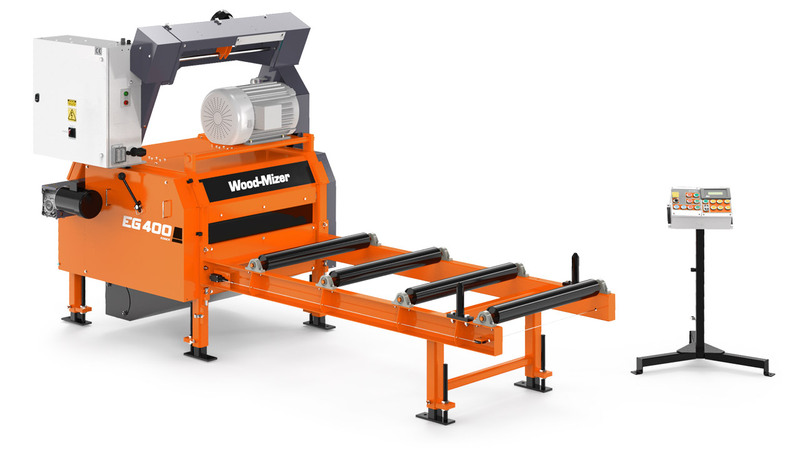 Wood-Mizer Asia is now offering a full range of high-throughput wideband sawmill equipment. First cuts on a new Wood-Mizer SLP line. Using DoubleHARD blades to cut rubberwood in Thailand. Watch the video!